In an era when CGI and hyper-realistic imagery dominate, it’s refreshing to see directors like Makoto Shinkai embracing an unequivocally hand-drawn look in animation. 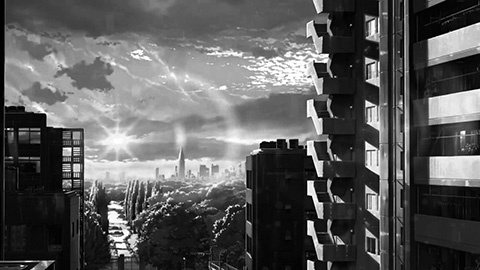 Looking at Shinkai’s renderings of drab Tokyo apartment blocks, endless telephone and train wires, and the random clutter of an apartment room, we are always aware that we are looking at a drawing. But it’s a drawing so vivid, so fully committed to accuracy, that it strikes the viewer as more poignant and more meaningful than a similar live-action shot would. We know that all of those little details were carefully selected and drawn, not simply captured with a camera lens, and that gives us a kinship with the artist – it’s clear what was significant to Shinkai, and it becomes significant to us as well. 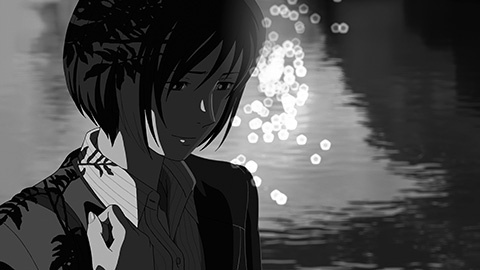 Shinkai and production company ComixWave have been making animated films since 1998. Their productions have varied considerably in theme and tone – the sci-fi love story Voices of a Distant Star, the epic adventure Children Who Chase Lost Voices, and the coming-of-age drama 5 Centimeters Per Second. Shinkai seems to be at his best, though, when he’s telling the stories closest to his heart. 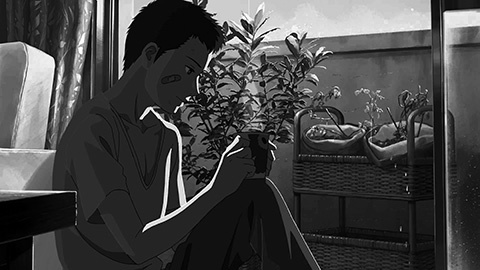 Like the well-received 5 Centimeters and his first short film She and Her Cat these are films that explore the everyday ups and downs of modern Japanese life, and the fleeting moments of love, beauty, and heartbreak that define them. 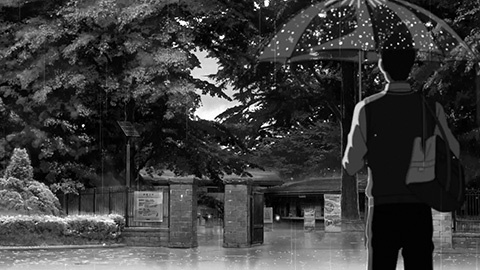 Shinkai’s latest, The Garden of Words, tells the story of a high school student, Takao, and a mysterious young woman, Yukari, who meet by chance under a gazebo on a rainy day in a Tokyo park. Over a period of several weeks, they continue to meet there whenever it rains. Not much happens, and yet a lot happens – in the film’s very short 46 minutes, we gradually learn about the boy’s dreams, what happened to the girl that she makes her escape to the park every day, and how their not-overtly-romantic relationship might evolve, or might not. 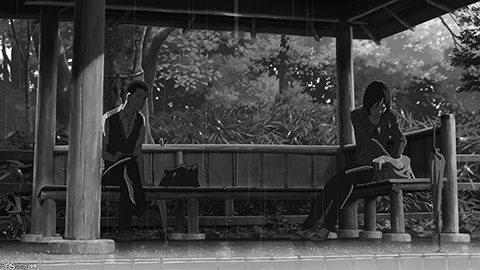 Like Ghibli’s Whisper of the Heart, The Garden of Words takes seemingly bland and uninteresting locations – school hallways and classrooms, a Tokyo park, cramped apartment rooms, train crossings – and imbues them with poetry. His long shots of rain falling in a park pond, of brilliantly coloured skies and foliage, and of little details like the labels on chocolate bar wrappers and brightly coloured vegetables in a bowl of ramen are simply stunning. His use of sound is also delightful – the rain, sounds of eating and drinking, the strangely quiet shuffling of thousands of commuters in a busy train station, the familiar warning bells of a train crossing – all of these bring the viewer more deeply into Shinkai’s world, or make long-term residents of that world see it afresh. He also isn’t afraid to be bold, creating scenes that mimic crane and helicopter shots, with the animated "camera" swooping above for a beautiful landscape view of the park and circling the familiar Docomo tower in Shinjuku against the backdrop of a setting sun. Where The Garden of Words falls short, though, is in silence and sentiment – there’s not enough of the former and too much of the latter. Hayao Miyazaki, Isao Takahata, Mamoru Oshii, and other great animator-storytellers are often content to let an image speak for itself, or to allow characters their moments of reflective silence. Shinkai relies too much on voiceover and melancholy piano scores. And though his characters have refreshingly authentic and un-stilted conversations about everything from workplace stress to beer, The Garden of Words unfortunately feels the need to close things with a tearfully over-the-top climax, made worse by the treacly pop song that plays over it. Shinkai’s films often seem to be at war with themselves, alternating between the lyrical, quiet beauty that Miyazaki and Studio Ghibli became justifiably renowned for, and the sentimental, clichéd plots and emotive acting styles that characterize so many anime series and Japanese soap operas. That said, The Garden of Words is still a gorgeous film, visually ground-breaking and with an authentic portrayal of pain, healing, and relationships that is marred by cliché only at the end. With each film, Shinkai and ComixWave seem to find their footing a little more. I’m looking forward to seeing more of their journey.